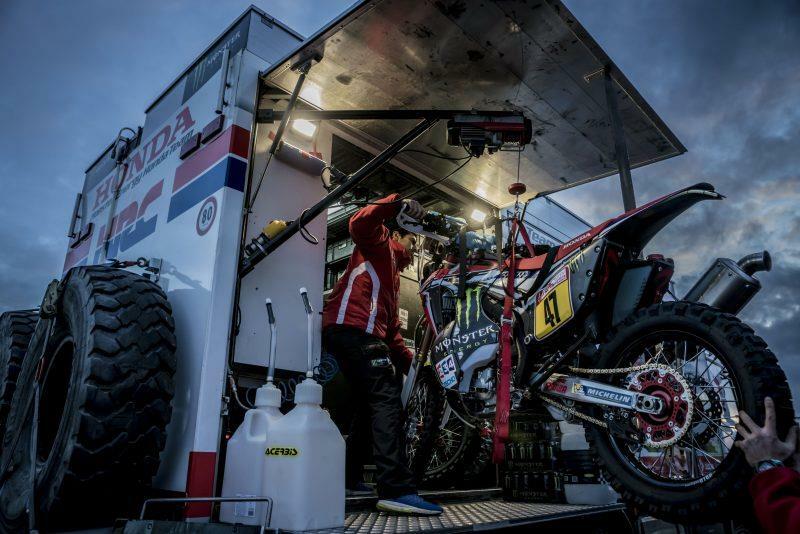 A Monster Energy Honda CRF450 has been stolen ahead of its departure for January’s Dakar rally in South America. Thieves broke into a lorry at the port in Le Havre, France, where the vehicles destined for the Rally in Peru are shipped from. After forcing their way into the vehicle, the thieves made off with the bike and also three helmets belonging to the team. The value of the rally bike has been estimated at an eye-watering €300,000 (£264,000). It was set to be transported to Peru, which was recently announced as the location for the 40th edition of the famed Dakar Rally ahead of next year’s event and was all ready to leave when the thieves struck sometime between Wednesday, November 22 and Thursday, November 23. It was due to leave for South America on Monday, November 27, where it would be for a month as it crossed the ocean. Honda are hoping to make a dent in KTM’s impressive dominance of the rally with the CRF450 and haven’t been beaten at the Dakar since 2001, marking them as the team with the target on their back. Namely Sam Sunderland, who became the first Brit to win the event this year and his team-mate, Australian Toby Price, who won in 2016. The Dakar is regarded by many to be the most gruelling race in the world, as competitors battle through some of the toughest conditions anywhere on the planet. This year’s route starts in Peru and will take competitors through Bolivia before finishing in Argentina and is nearly 9,000km long in total. Why not check out MCN's YouTube channel?